This program focuses on agriculture and its importance to the region. Viewers will learn about and experience a close-up look at every aspect of the journey crops and commodities take from field to fork across the San Joaquin Valley, and beyond. Each show is comprised of several segments that demonstrate how crops are planted, tended, harvested and processed. Many episodes include a cooking or consumer segment that utilizes the featured crop. Fresno County Farm Bureau CEO Ryan Jacobsen is the host of the show. During Valley’s Gold, Jacobsen speaks with growers about their family histories and helps share insight into the various techniques, practices and advancements used in California farming and agriculture. ValleyPBS enriches, educates and strengthens our diverse Valley community through the power of public service media. For 36 years, ValleyPBS has provided PBS signature programming, as well as locally produced shows and is the Valley’s Preschool, Classroom, Stage for the Arts and Lens for Exploration, pointing citizens of all ages to destinations where their interests will be served, their spirits lifted and their voices and perspectives heard. ValleyPBS broadcasts on three channels – ValleyPBS-HD, Valley Create (DIY/lifestyle programming), and Valley Vme (Spanish language). 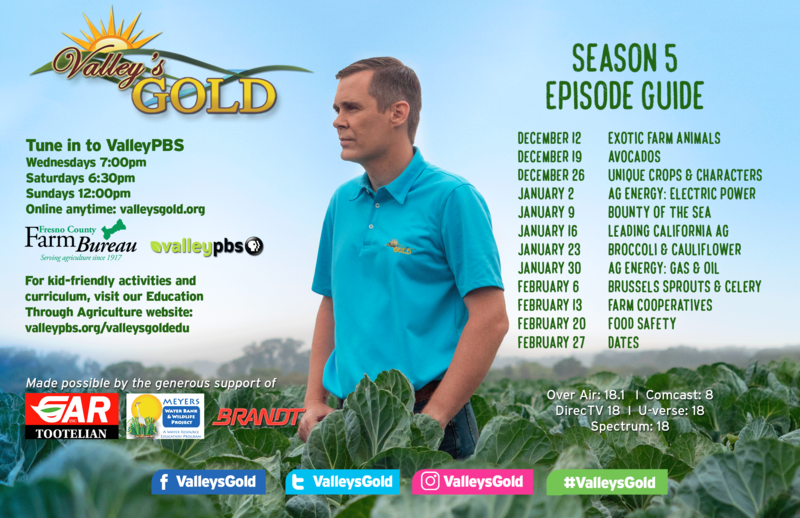 The most up-to-date program schedules and “where you can watch” ValleyPBS in your local community can be found at valleypbs.org. Fresno County Farm Bureau is the county’s largest agricultural advocacy and educational organization, representing 4,000 members on water, labor, air quality, land use, and major agricultural related issues. Fresno County produces more than 400 commercial crops annually, totaling over $6.58 billion in gross production value in 2012. For Fresno County agricultural information, visit fcfb facebook.